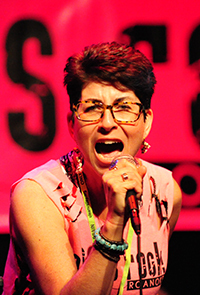 After Professor of Gender and Women’s Studies LeeRay Costa saw how transformative a rock ‘n’ roll camp was for her daughter, she brought it to Roanoke. Sometimes a punctuation point can make all the difference. Consider, for example, the difference between Girls Rock. And Girls Rock! The first implies a quieter relationship between girls and rock ‘n’ roll—maybe even a sidelines role. The second injects some energy into the equation, making it clearer that girls can play a more active role by composing, playing, performing—and even promoting—their music, starting from a young age. LeeRay Costa, the mother of a music-loving daughter, envisioned this kind of experience for her child. A professor in the gender and women’s studies department, she stumbled across the Girls Rock! program, which originated in Portland, when Tallulah was only five, too young to participate. Still, Costa filed the idea away, and when Tallulah turned nine, Costa and her husband, Andy Matzner (who teaches in Hollins’ M.A.L.S. program), traveled to the nearest GR! camp, in Durham, North Carolina. 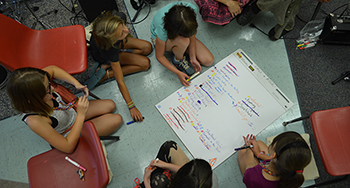 Campers collaborate on their band’s name. Although GR! camps exist all over the country and around the world, each develops its own curriculum. For the Roanoke camp (GR!R), Costa and Bratic began with a vision: “We wanted to use music and creativity as a vehicle to teach self-confidence, self-efficacy, healthy risk taking, and conflict negotiation,” Costa says. “We wanted to create a positive, uplifting environment for girls who in many ways in our society are being taught to compete with one another, to judge one another, to isolate from one another. Their first GR!R camp launched in the summer of 2013, with full enrollment of 30 girls ages eight to 12—and with a waiting list. “It was an amazing experience,” Costa says, “so we decided: Roanoke seems interested.” After two years, they added a second camp for teen girls, ages 12 to 16. All girls are welcome, and an active fundraising program insures that no girl will be refused admittance because of an inability to pay. No previous music experience is required, either. The camp supplies it all: instruments, including keyboard, drums, bass guitar, electric guitar, and ukelele; instruction on singing and performance techniques; rehearsal time; and workshops on everything from poetry to dance, from mindfulness and social justice to self-defense. 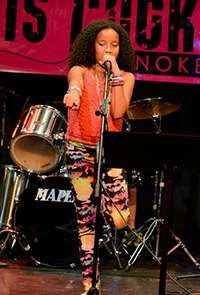 At the end of the week, each band performs an original song in front of a live audience. Campers receive instruction on singing and performance techniques. Now that GR!R has its feet firmly on the ground after five summers of camps and an expansion to year-round programming, Costa is taking more of a backseat role. Having studied nonprofit organizations for her doctoral dissertation, she knows they can suffer from “the founder problem” when the person who started it all has trouble “stepping away and letting go. From my perspective, for the organization to continue to grow and evolve, we need new energy and people and ideas,” she says. Costa credits GR!R volunteers—the workshop leaders, the roadies, the fundraisers, the board members—with the organization’s success. Their participation is vital, she says, because “we want our campers to see women filling all of these roles. So often in the music industry, it’s a boys’ club. Music spaces are not necessarily inclusive of girls and those who may be just learning new skills and the language that goes with it. 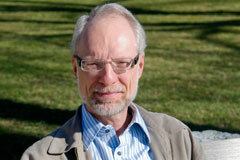 Jean Holzinger is guest editor for this issue of Hollins magazine.